If you are looking to for Full or DIY Livery, Grazing or trying to find stables to rent in Berkshire. There are a wide variety equestrian establishments offering a range of livery facilities including indoor school, outdoor arena, show jumps, cross country courses horse-walkers etc to choose from. We have listings for stables, livery yards, equestrian centres and grazing, in Ascot, Bracknell, Bradfield, Burchetts Green, Hungerford, Maidenhead, Pangbourne, Reading, Slough,Taplow, Thatcham, Tilehurst, Windsor, Winkfield, Wokingham and other areas of Berkshire. 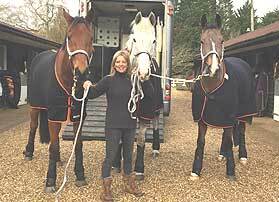 British Horse Society Approved Equestrian Centre offering Livery Services for horses and ponies. We are a small Exclusive private yard situated in the heart of Ascot, with direct access to miles and mile of off road hacking/ beautiful facilities and friendly atmosphere..
British Horse Society Approved Riding School and Livery Yard. Full Range of Livery Services - Post Rail Paddocks - Floodlit Rubber Arena - Horse Walker.